Time schedule of all championships is placed in Calendar. League or Championship between leagues. For participation you have to register your team in the League before its start. The league starts on 6th of each month and lasts for 4-5 days. You have to play the home and away matches with each competitor. If you play less than 20% of all matches, that you are supposed to play in league, then you will pay a fine. The best forward of each league gets +0.5 of experience. Revenue: 10$ from the ticket for a match. 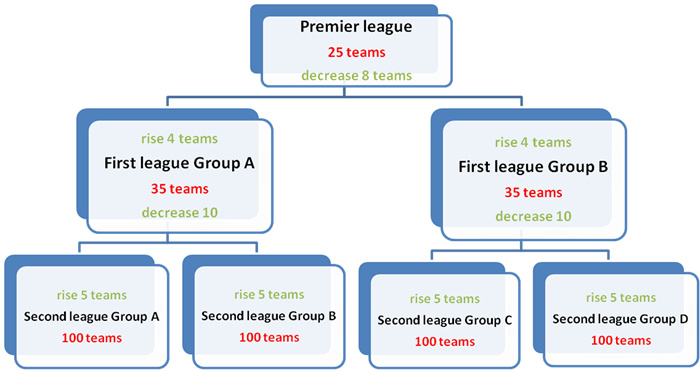 League number of teams number of teams which decrease experience for goal maximum attendance of stadium, th. Country Cup. Usually it starts from 15th of each month. The higher your rating is in the fixture list of the league - the more chances you have to get invitation for playing in Country Cup. Revenue: 10$ from the ticket for a match. It starts from 1/16, then 1/8 and so on up to the final. UEFA Cup and Champions League You have to pass the group phase, afterwards play off 1/8, 1/4, semifinal (1/2) and final. Revenue: 15$ from the ticket for a match. Commercial championship It allows to earn money for managers who have a stadium. Usually it starts on 19th of each month. All participants are divided in groups, each of them contains 20 teams. Afterwards, the group phase (like in UEFA Cup and Champions League) occurs. Revenue: 1.5$ from the ticket for a match. It starts from the election of manager for national team. All interested managers can apply by sending a request for management of national team. In case when few managers claim for the same national team, the manager , who has a highest level (and Fair Play rating if required), will be chosen. Election lasts for 2 days. At the same time, all managers can propose their footballers to be enrolled in the national team. When the managers of national teams are chosen, they start to choose the footballers for national teams (max. 23 footballers per team), this process lasts for 2 days also. National teams, which have less than 11 footballers will not be able to play. The schedule is next:Qualification, group phase, 1/8, 1/4, semifinal (1/2) and final. Advantages: the increment of experience for footballers from the national team is 2 times higher than in usual official matches. When the national team loses, its footballers dont lose their experience. Revenue: 20$ from the ticket for a match.